At Scarning we have a well equipped workshop with two large ramps fitted with wheel-free facilities. Two full time technicians are on hand to repair or service your trailer to keep it in top condition, safe and legal. 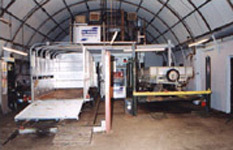 We have the facilities to service any make of trailer. Police spot checks on trailers are becoming more common and even minor faults with the braking or lighting system can lead to prosecution. Regular service is recommended for safety and peace of mind. We have a large stores department with good stocks of genuine spares for Ifor Williams, Hudson Trailers and the Meredith and Eyre Trailer range. A carrier calls daily for next day delivery if required.